Fifth-seeded Bojana Jovanovski won her first WTA title Saturday with a straight-set victory over Julia Cohen in the Baku Cup tournament in Azerbaijan. 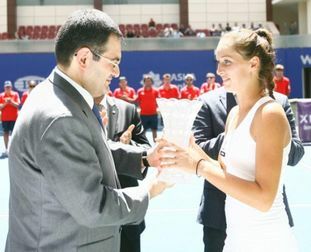 Jovanovski was awarded $37,000 for hers win. Before the 2012 Baku Cup, Jovanovski's best results were the 2011 Sydney semifinal and three quarterfinals. The Ambassador Extraordinary and Plenipotentiary of the Republic of Serbia to the Republic of Azerbaijan Zoran Vajović welcomed the Serbian delegation in the UNESCO historical heritage Old Town – Icheri Sheher, where the Embassy building is located. The number 95 tennis player of the world ranking, 20 years old Serbian Yovanovski has won the first game by the score 6:2. The player gained the victory in the second game with the same score. The match ended by the score 2-0. After her victory on the Russian tennis player Yovanovski reached the final of the international Baku tournament. 1st Gabala Cup Tournament reaches to end with the awarding ceremony in Gabala city. Vice-president of FC Gabala Fariz Najafov presented memorial gifts to final round referees before all team captains. Later on, footballers of different nominations were awarded. Then, Serbia MK and Levante, respectively 2nd and 3rd places takers, got their rewards by AFFA secretary general Elkhan Mammadov, Professional Football League president Ramin Musayev and Gabala vice-president Fariz Najafov. Željko Joksimović, a popular Serbian singer, has been chosen to represent Serbia at the “Eurovision 2012 Song Contest” which will be held in Baku in 2012. He had already participated in this contest for three times – the first time was in 2004 with a song called “Lane Moje” and took the second place, then he participated in 2006 as a composer for a song called “Leyla”. In 2008 he composed a hit song for the representative of Serbia, Jelena Tomasevic. The song for the “Eurovision 2012” will also be composed by Željko. Between 16 - 20 of November, 2012 the delegation of the Ministry of Youth and Sport of the Republic of Serbia, which included Mr. Aleksandar Borisavljevic from the British Council in Serbia (Information Services and Project Officer), Ms. Ana-Marija Simonovic from the RDU RTS/Serbian Broadcasting Corporation (PR Manager), Ms. Smiljka Zivanovic from the Ministry of Youth and Sport of Serbia (Junior Advisor), Ms.Vesna Zivkovic from the local Youth Office in Krusevac (Coordinator), Ms. Violeta Stevovic from the Educational Center Krusevac (Director), Dzemaludin Paucinac, from the local Youth Office from Novi Pazar (Coordinator), had visited the Republic of Azerbaijan. Within the framework of this visit the delegation got acquainted with the youth policy implemented in Azerbaijan and held meetings in the Youth Organization “İrəli”. At the same time, for the purpose of getting acquainted more closely with the rich history and culture of Azerbaijan, they visited such historical places as the city of Ganja. A‘’round table” was held on the 16th November, initiated by the visit of the Serbian delegation. The presentations of both countries’ youth policies were shown. In addition to that, discussions about the perspectives for further cooperation in the following years in the sphere of work with the youth between Azerbaijan and Serbia were also conducted. In accordance to the agreement upon the cooperation in the sphere of work with youth and sport, signed between the Ministry of Youth and Sport of the Republic of Azerbaijan and the Ministry of Youth and Sport of the Republic of Serbia, which was within the framework of the program for “Active citizens”, the officials of the Ministry of Youth and Sport of the Republic of Azerbaijan were visiting Serbia between 22-27 August, this year.